In the thick of the disco and Blaxploitation era, many films came along capitalizing on both trends, but few seemed to marry both with a set of unique characters the way that Car Wash did. Besides its theme song eventually becoming a quintessential 70s hit radio single, the film managed to capture the feeling of working at a blue collar job on a sunny L.A. afternoon with a bit of comedy and human drama melded together. 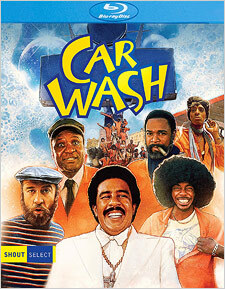 I’ll admit that I’ve never really been a huge fan of Car Wash, but I can certainly see its appeal. It makes me wonder if Spike Lee was, at least in part, inspired by the film when he made Do the Right Thing, as they have a similar structure. The cast of characters, many of which weren’t even mentioned in the advertising because of the star power of George Carlin and Richard Pryor (who are barely in the movie), is unique. Notable members of the cast include Bill Duke, Antonio Fargas, Melanie Mayron, Franklin Ajaye, and Pepe Serna. Eagle-eyed viewers should also watch for Danny DeVito, Brooke Adams, and Tim Thomerson, the former two of which were originally in the movie with expanded roles, but had their scenes cut, leaving them mostly in the background. Shout Select’s transfer of the film is slightly soft, but features a lot of strong detail. Facial and clothing textures are prominent, even though grain levels are somewhat minimal. However, there’s strong color reproduction with natural skin tones on display, as well as deep blacks with satisfactory brightness and contrast levels. It’s also a stable presentation, but some obvious film damage has been leftover, although it’s fairly brisk when it occurs. It includes scratches, staining, holes, lines, and some speckling. Otherwise, it’s a sharp-looking presentation. The sole audio option available is an English mono 2.0 DTS-HD track. It’s generally flat, but there’s some fidelity to be had. The score and the musical selection, which were part of the movie’s main selling point, have some decent room to breathe. And in a movie full of overdubs, the quality of the dialogue changes often, but is always discernable. Optional English subtitles are included. In terms of extras, there’s an audio commentary with director Michael Schultz; two interviews (Workin’ at the Car Wash with Otis Day and Car Wash From Start to Finish with Gary Stromberg); 4 radio spots; and the original theatrical trailer. Unfortunately, the TV version couldn’t be included as an extra, if it could even have been dug up at all. Car Wash is a film that many older fans still love and enjoy nowadays, but Shout Select’s release is bound to gain it some new ones, both young and old. It’s dated, or rather completely soaked in its own era, but the characters and the music are all that really matters. It’s good fun and a welcome title on the Blu-ray format.